IT failure costs companies around the world billions in wasted expense and lost productivity. 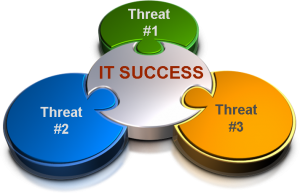 There are three key reasons that cause an IT organization to fail. 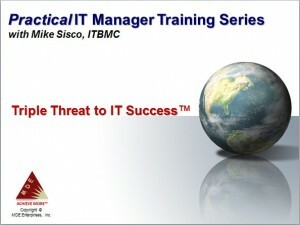 Learn what they are, how to identify if they exist and what to do to eliminate these threats in your company and position your IT organization to achieve more success. Access the training immediately via recorded session or choose to attend a scheduled event during the registration process. I’ve worked with and observed hundreds of IT organizations and literally thousands of IT managers in my career of over 30 years. In doing so, I’ve concluded there are three primary reasons IT organizations fail. I call this the “Triple Threat to IT Success”. The sad thing is that most IT managers and non-IT managers do not fully understand why the company’s IT organization is failing, , , they simply can’t put their finger on the problem. Senior management may feel like something isn’t quite right but they can’t articulate the issue and they can’t help their IT organization. The same thing applies to the IT managers. If they knew what the problems were and how to fix them, , , they certainly would do so because most IT managers are very conscientious and want to do a good job. Learn what causes IT failure and the underlying source of these problems in this session along with simple remedies that will help you position your IT organization for much more success going forward. A recorded version of this program can be accessed immediately or you may schedule to attend a scheduled event during the registration process. You will receive a replay option after attending so you can revisit the material at any time.